We have received multiple complaints from our readers about a new binary trading software called NavStar Trader. This prompted us to launch a full investigation to see if NavStar Trader is a scam, and indeed it is. We have found plenty of evidence to prove our case, so make sure you read our full NavStar Trader review before you invest anything into the scam! Is it really possible to make $900+ every hour on autopilot? 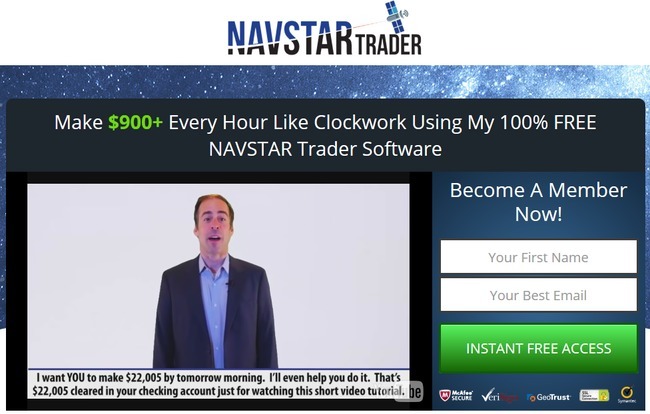 When you are first introduced to the homepage of NavStar Trader website, you’ll immediately see the striking headline that reads “Make $900+ Every Hour Like Clockwork Using My 100% Free NAVSTAR Trader Software”. Will NavStar Trader software really make you so much money on autopilot? Of course not. Unlike what they claim, NavStar Trader scam doesn’t come free, too. These are just marketing tactics used by online scams to catch your attention. The only purpose is to make you watch the sales video, where they try to brainwash you using carefully crafted sales pitch. Our job here is to give you an objective view of the scam, and help you to identify the traps NavStar Trader has laid out for you. Social approvals can be very powerful to boost the credibility of a product, and apparently the scammers behind NavStar Trader understand its importance too. They decided to use fake Facebook posts to gain trust and to manipulate their potential victims. You can find the fake Facebook posts right below the sales video of NavStar Trader scam. Try clicking on the profile pictures, names, or even try interacting with the posts by liking or commenting on them. You cannot interact with any of the posts, much less visit the Facebook profiles of these so-called members. Before you give away all your personal information (including your phone number), you’ll be presented with the testimonials of a few member that seem to be doing extremely well with the software. 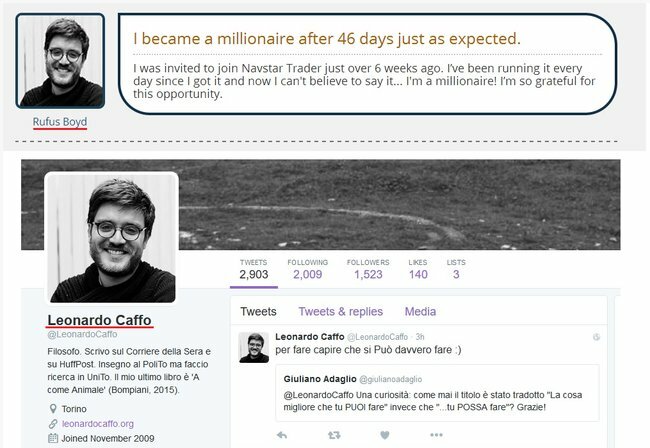 One of them is Rufus Boyd (see screenshot above) who claims to have become a millionaire in just 46 days using NavStar Trader software. We decided to do a reverse lookup based on the picture provided, and we found the original owner of the photo. The photo belongs to Leonardo Caffo, and the picture was stolen from his Twitter account as shown above. You can view his Twitter account from this link. NavStar Trader scam blatantly fabricated a fake name for his picture and posted a fake statement to endorse the scam, and to confuse its potential victims. How did NavStar Trader generate trades on a Sunday? There’s a section in NavStar Trader website where it displays the “live trade results”, which shows a series of winning trades made by the software. This review was written on a Sunday, and anyone who have traded binary options before would know that there’s no market activities during weekends. In other words, no trades can be made on Sundays. So how did NavStar Trader manage to display live trade results on a Sunday? The truth is, the live trade section for NavStar Trader was just a fake results panel generated using a computer script that pair fictitious results with the current time. It would’ve worked well during the weekdays, but when it comes to weekends their trick would be exposed. 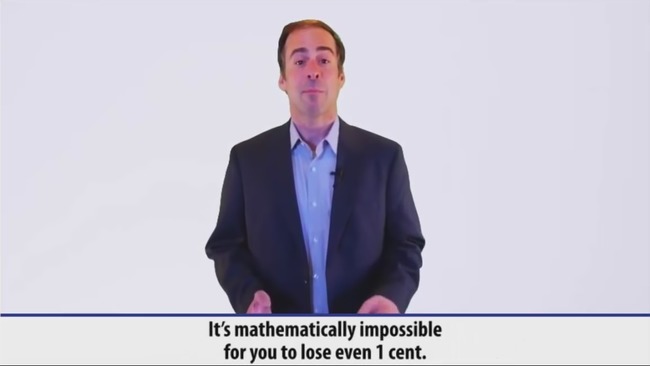 In the sales video, Ethan made a bold promise by claiming that it’s impossible to lose even 1 cent with his NavStar Trader software. He claims that his software will make a counter-trade to hedge your investment if the software detects a risk of losing a trade. But was he telling the truth? Let’s take a look at the disclaimer document that NavStar Trader scam tries to hide from you. No matter how NavStar Trader scam tries to deceive you with their sales material, they have to document the true nature of the scam somewhere in the website to avoid legal actions. The chose to hide the truth deep in the risk disclosure statement, which you can’t find anywhere in the sales material. The only way to access the document is to scroll to the bottom of the page and look for a small fine-print that that reads ‘risk disclosure statement’. You can authenticate the terms we’ve quoted here against the original document on their website: websiteterms.co/NavStarTrader. Due to the high risk nature of trading, ‘NavStar Trader” explicitly does not make any express or implied warranties or guarantees that user will make any profit or that user will not lose any or all deposited investment funds. Self explanatory – Contrary to what they promise in the sales materials, NavStar Trader scam does not guarantee you any profit. Not only that, you will most likely end up losing ALL your deposited investment funds. Again, NavStar Trader scam admits that trading binary options is extremely risky, and it is only for investors who can stomach the loss of their entire investments. Compare the terms stated in their risk disclaimer against what they promise you in the sales material, and you’ll see how they are trying to escape the blatant lies they have promised you in the sales materials. YES, NAVSTAR TRADER IS A SCAM. We strongly advise you to stay away from the scam if you don’t want to lose your hard-earned money. OMG u saved me a fortune! Thank you!